Because it is naturally porous, grout that has not been sealed properly will attract all kinds of stains. In the kitchen, you may end up with coffee, wine, or food stains, while bathroom walls or flooring can easily be marred by mildew and mold stains. Without the protection grout sealing provides, you could get stuck with a large repair or replacement bill. Is it high performance grout? Is there an additive in the grout that allows it to naturally repel stains? If the grout doesn’t meet these requirements — and most will not — you should definitely seal it. Sometimes contractors quote a flat price for installation and then don’t want to take extra time to provide for sealing it. You can make extra sure of the need for sealant by checking with the grout manufacturer for details, or by placing a few drops of water on your grout. If the water is absorbed, you definitely need to seal. The only time you should hold back on sealing is right after new grout has been installed. It needs 10 to 14 days to properly cure. Make sure you are extra careful about stains during this waiting period. If a deep stain occurs during this time, you may need regrouting services right after a new installation. Seal It and Forget It! If you stick to a regular grout sealing plan of once every six months, you won’t have to worry about grout repair or replacement for years to come. This alone makes sealing a wise financial decision. 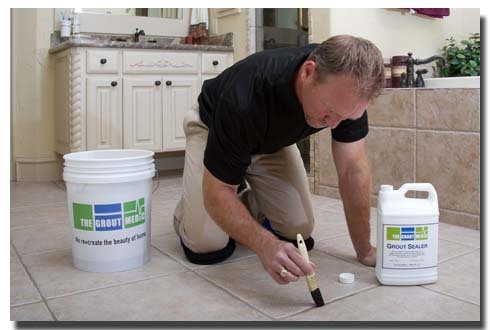 We hope you follow these tips for smart sealing of your grout. If you are ready to protect your flooring and walls from stains, mildew, and other damage,contact your local Grout Medic location today!